Standard Mainsail Features: Class reef, cunningham, tapered racing battens with a full top batten, Kiwi luff slides, sail numbers, telltales, draft stripes, class royalty and roll bag. A powerful shape in light and underpowered conditions, this design also flattens for speed and pointing in medium-heavy wind conditions. This sail has been proven on the race course and is very versatile, fast, and easy to trim. Pull it in and go fast! This design has a flatter shape with a straighter exit for medium to extreme conditions. The sail flattens and shapes with mast bend and rig tension. The sail is specifically designed with a crosscut body and radial clew to maximize and maintain shape in the highest load areas and minimize stretch. This is the sail of choice at windy venues. This sail is designed and constructed to be a fast sail in all conditions. This is the best sail on the market today. Sailors will see a durastic change in boat speed and overall performance due to the nature of this sail. Standard FiberPath Jib Features: Load mapping of primary and secondary loads, constructed with the toughest aramid fibers allowed in the J/105 class rules; vertical battens, adjustable foot and leech cords, a telltale window, telltales, draft stripes, class royalty and a roll bag. This design is for the full range of conditions – fastest for drifting to overpowered conditions. The shape allows for an easy groove to steer to and has speed and pointing ability on demand. The custom RBS tapered vertical battens on this sail keep the leech straighter longer. This sail is fastest in light to medium conditions. The design has is slightly fuller then our successful AP design resulting in power and point in the lower wind ranges. This sail is fastest in medium to extreme conditions. The design has a narrower entry angle and flatter overall shape. As a result, it will depower and change gears much easier when the breeze come up. It also responds efficiently when the boat becomes overpowered, maintaining pointing ability and speed. This sail has proven very fast in smooth water. Standard Features: Class royalty, taped seams, your color choice, sail numbers, and a sail bag. This sail is not only fast, but extremely easy to trim. Ullman spinnakers are known for their speed in almost every one design class and the J/105 is no exception. 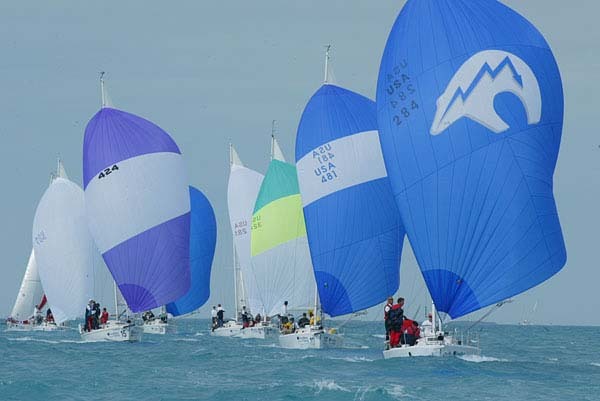 The Ullman spinnaker designs fly with more projected sail area than chutes from any other sailmaker – thus translating into speed when sailing tighter wind angles in light to medium wind conditions, and acceleration in medium to heavy wind conditions when sailing larger wind angles. This design was developed for the 2007 Lipton Cup Challenge. San Diego Yacht Club used it and never looked back, dominating the regatta. The RUN design’s extra luff shape allows the whole sail to rotate better to weather – even better than our AP Design – and lets you sail deeper, faster! This sail delivers the most actual flying sail area compared to any J/105 spinnaker from any other sailmaker.